The purpose of this lab was to perform a titration with HCl and NaOH to find out the concentration of the NaOH given you had a 1.5 molar solution of HCl. Fill the burette with NaOH and mark the amount it is at. Put 10 ml of 1.5 molar HCl in a erlenmeyer flask directly below the burette so the NaOH can drip into it. Put 2 drops of the phenolphthalein indicator in the solution of HCl. Slowly drip the NaOH into the solution until the color of the solution turns a faint pink. By performing a titration, the pH of the NaOH was able to be determined. There was a known concentration of 1.5 molar HCl. By having the known concentration of the strong acid, you can calculate the concentration of the base. The base was slowly dripped into the solution of the acid and the indicator. When the pH of the solution reached around 7, the color or the solution will change from clear to a faint pink. 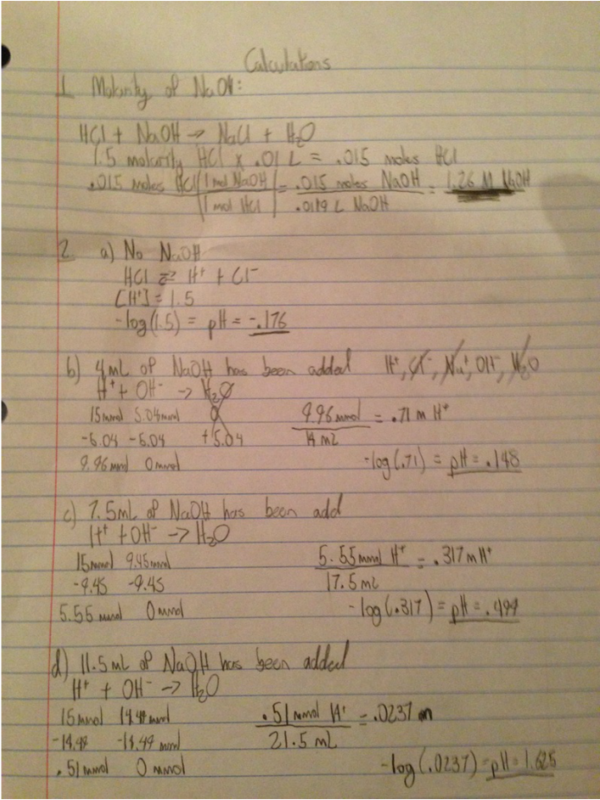 By calculating the volume of base used to change the pH of the 1.5 molar HCl, you can calculate the molarity of the base. 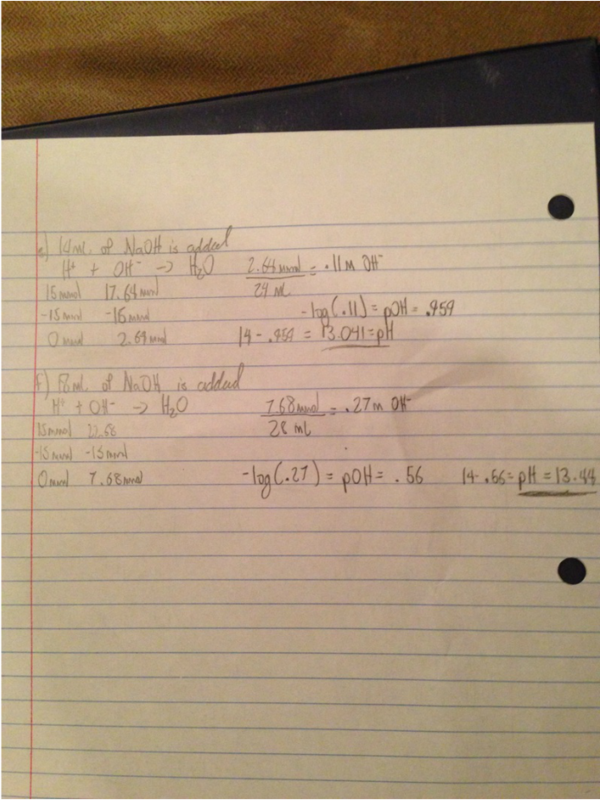 It was determined that the molarity of the NaOH used in this titration was 1.26 molar. In this lab, titrations were used. Titrations are very helpful tools in chemistry and are necessary for safety. A titration is performed to find out the concentration of an unknown solution of an acid or base. It is done by adding the unknown solution to a solution of a known concentration. The starting point of the unknown concentration should be noted. Then by slowly dripping the unknown into the mixture of the known concentration and the indicator, the color of the solution will eventually change. At the point of the color change, the volume change in the unknown concentration should be calculated. By using the mole to mole ratio of the reaction, the moles of the unknown concentration can be determined. After the moles are determined, divide that by the amoi9u In the solution of the known concentration, an indicator is added. An indicator is a usually a weak acid that when the pH changes from an acid to base or base to acid, it will change the color of the mixture noticeably. Indicators need to be picked based on the type of titration that is being performed. The goal is to pick an indication that will change at the equiovalency point of the mixture, or when all of the H+ and OH- ions are used up and the reaction is complete. If the titration is with a strong acid and a strong base, an indicator that changes at a pH of about 7 is suggested because that is about even between strong and strong. If it were a strong acid and a weak base, the equivalency point should be lower than 7 and with a weak acid and a strong base, an equivalency point greater than 7 would be best. The purpose of a titration is to determine the concentration of a solution of a base or acid. An indicator is a substance that undergoes a color change in the pH interval of the equivalence point. When the reaction is completed between an acid and a base, this is the equivalence point. The goal is to use an indicator that changes color at the equivalence point. If a strong acid and strong base are being titrated, an indicator that changes between a pH of 5-9 should be used. If it is between a strong acid and a weak base, the indicator should change at a pH below 5. 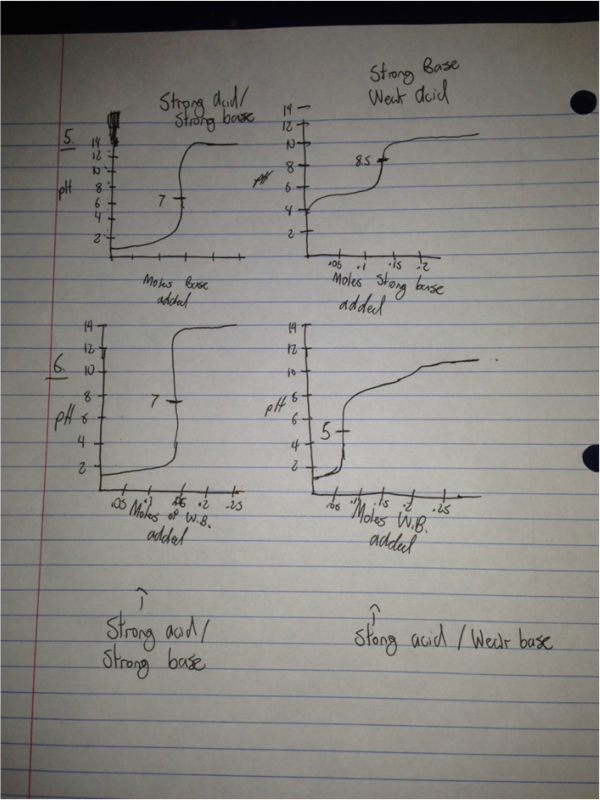 If it is between a weak acid and a strong base the indicator should change at a pH above 9. The indicator that is used should be decided based on the equivalency point of the reaction. This will depend on whether or not the solutions that are used are strong or weak. The equivalency point is when the titration reaction has been completed. The end point is when the indicator changes color. When performing a titration, the end point of the indicator should equal the equivalency point of the reaction. The equivalency point for a strong acid and strong base will be lower than that of a weak acid and strong base. The equivalency point for a strong acid and strong base will be higher than that of a strong acid and weak base. A buffer solution is a solution that resists change in pH when either a strong base or strong acid is added to it. A buffer contains a weak acid and its conjugate base. When a strong acid is added, the H+ ions will react with the conjugate base to form more of the weak acid to make the solution reach equilibrium again. By doing this the H+ ions are used up and do not contribute to the pH. When a strong base is added the OH- ions react with the weak acid to form water and the conjugate base. The OH- ions are used up when the reaction is performed and will not contribute to the pH.